Some bucket-list tropical destinations have great airports and amenities, others not so much. Bali is that sort of destination where you are not exactly sure what to expect of the airport. 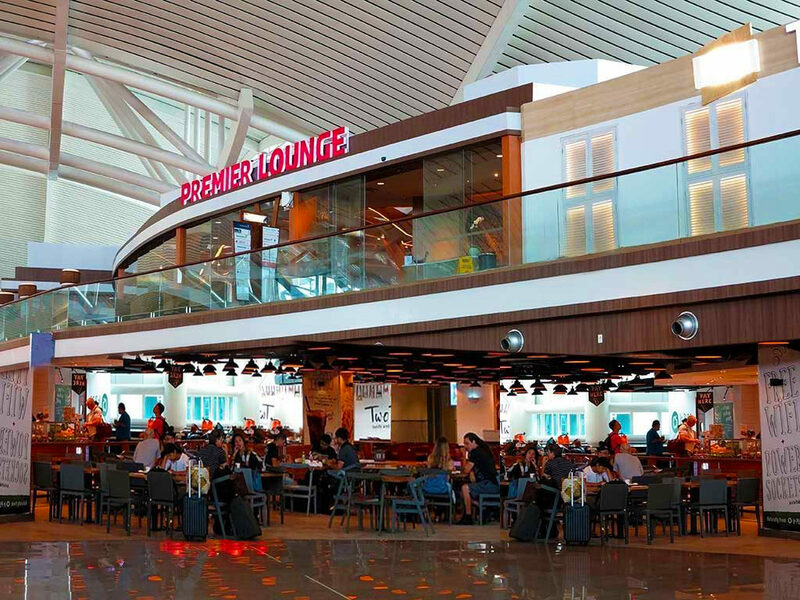 Overall, the Ngurah Rai International Airport (DPS) in Denpasar provided a solid experience including the Bali airport lounge offering in the international terminal. Before arriving, I had already checked out my Priority Pass app to see what lounge would be available to me on the day of my departure. I was doing an Asia trip to include Bali, Singapore and Taipei. This visit to the lounge would mark the end of the first of those three destinations. The Hyatt Regency Bali offers chauffeured transportation to/from the airport. This early morning I decided to let them take care of all the arrangements and get me there about three hours before my flight departure time which provided ample time to check out the Premier Lounge inside the airport. How Do I Get Priority Pass For Free? Upon entering the airport, I was taken aback by how gorgeous it was. It is a remarkable improvement over the previous airport. The new international terminal opened in November 2013. Unfortunately, the airport will have a short life as plans are already underway to construct a larger airport north of the city. Once you get through security screening, you are directed through a maze of duty free shops. This seems to a growing trend in many foreign airports. I like looking at all the displays and it made me realize just how much the US’s celebrity culture influences campaigns around the world. Once you clear the duty free maze, an area opens up inside the terminal. From here, you can easily spot the Premier Lounge with its red lettering above on the mezzanine floor. You get to the upper floor via a small elevator. If you are flying on one of the following airlines you are granted entry to the lounge as a premium cabin or elite passenger. One of the best programs for lounge access worldwide is Priority Pass, which provides access to more than 1,200 lounges around the world. Participating lounges include a mix of airline, airport, and independent locations, mostly in departure areas. Premium credit cards, like the American Express Platinum and Chase Sapphire Reserve, include full Priority Pass memberships with up to two guests. Although it is fairly easy to gain access to the lounge, during my stay of more than two hours there was only one other guest. This lounge is located in the new international terminal on the mezzanine level. As such, it is only accessible to passengers departing on international flights. The lounge is open 24 hours daily. Upon entering, it was impossible not to notice that the air conditioning was not working! The humidity and the warm temperatures made the lounge uncomfortable. I questioned the lounge staff and they provided a personal air conditioning unit to be placed towards our seats. This was a marginal improvement at best but made the experience somewhat bearable. The decor struck me as quite ordinary but at least it isn’t bland with a varied mix of seating choices. There are lounges, couches, plus many two chairs with small circular tables set-ups. Also, there is an outside seating area, overlooking the terminal and shopping areas below. I spent a good deal of time in this area overlooking the travelers below as they were shopping and heading to their gates. I often enjoy a good balcony or mezzanine above the airport’s main level. The color scheme indoors was yellow, orange and brown and while vibrant, was not the most relaxing color scheme. However, the wall had an impressive, intricate design. The ambiance and decor was totally okay but it was nice that the lounge was almost completely empty. There were a few statues and figurines placed around, but nothing that stood out as extraordinary. There is a shower room available. With only one other guest in the lounge, it was a sure bet I could get in quickly. The staff managed a small desk area from where you could request a drink, but there was little staff activity witnessed this morning. The male and female staff segregated themselves, chatting or looking at their computer screens. The liquor offerings were sparse. There were a few brand name scotches, one gin, one vodka and two choices of wine: red or white. I arrived during breakfast hours and the buffet was fully stocked. However, not once did I see a lounge attendant come to the buffet to re-stock, clean or check on anything. Some of these offerings led me to believe they set up a buffet that serves as both breakfast and lunch. Getting past the issue of the air conditioning (the staff blamed the airport for the equipment failure), the lounge served its purpose as a quiet, restful place to enjoy some complimentary food and beverages. I certainly enjoyed the variety of seating options. I finally settled on a large private couch arrangement with our personal air conditioner keeping us refreshed. For a quiet place to get some rest and grab some food and drink, this lounge fits the bill. Although not the nicest of airport lounges it served us well — I just wouldn’t arrive particularly early to use it. A wine toast farewell to Bali and we were off to Singapore. Do you plan to put Bali and the Premier Lounge in your upcoming travel plans? The AC did not work all of 2017 either. I made 4 or so visits spread throughout that year. The duty free S-curve maze that forces max walking in short space and the lack of AC in lounge and rest of airport makes DPS the most miserable airport I’ve ever been to. Thanks Hans for letting us know that the A/C is an on-going issue. Helpful to our readers! Some love the Duty Free maze; others–not so much. If I have time before my departure it can be entertainment and I like to see what’s the latest items being promoted.